For the third year in a row, University of New Brunswick President and Vice-Chancellor Eddy Campbell has been named one of the top 50 CEOs in Atlantic Canada. The winners of this year’s Atlantic Business Magazine competition were celebrated at an awards gala held on May 7 at the World Trade and Convention Centre in Halifax. Kathryn McCain, chair of the university’s Board of Governors, congratulated Dr. Campbell on the award. Dr. Campbell said the award recognizes the strength of UNB and the commitment of its faculty and staff. 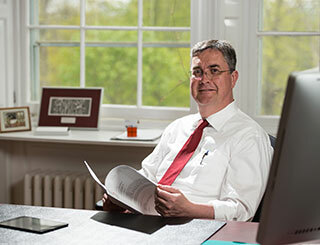 Upon arriving at UNB in 2009, Dr. Campbell led the development of a strategic plan building on UNB's rich tradition of education, research and community service. In the spirit of the strategic plan, UNB has established a number of entrepreneurial initiatives including the Pond-Deshpande Centre, a significant addition to the university’s superb capacity to support entrepreneurship and innovation. During his tenure at the university, he has built on the work of predecessors in establishing the Tucker Park Collaborative on its Saint John campus, opening state-of-the-art student and research facilities such as The Richard J. CURRIE CENTER and the Hans W. Klohn Commons while UNB has been named one of Canada’s Top 100 Employers in 2013 and 2014. Dr. Campbell was selected for the Atlantic Business award by a respected panel of senior executives. He was also selected a Top 50 CEO by the magazine in 2013 and 2014. For media requests, please contact Communications & Marketing.